This recipe harkens back to my stepfather’s childhood, but with some modern twists. Grandma was always trying to come up with ways to fully utilize the summertime harvest from their garden – she didn’t want anything going to waste. 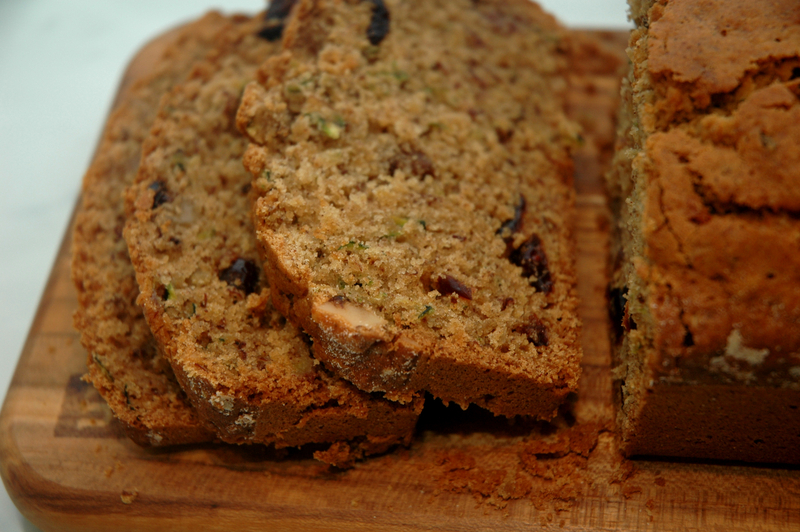 She came up with a tasty zucchini bread that made good use of their fresh zucchini, with help from bananas and walnuts. Her bread always got the thumbs up from her large brood of seven boys. My stepfather has always shared fond memories of coming home from school on a cold day and being greeted by the comforting smell of warm zucchini bread served with fresh butter. In this updated spin on the classic, we’ve replaced regular flour with a gluten-free flour mix and removed the dairy and replaced it with coconut oil. We added some dried cranberries to give it an extra zing. 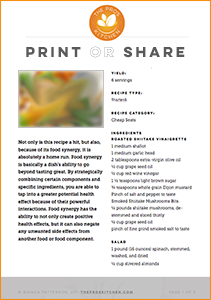 This modern version caters to the little one’s nutritional needs while still maintaining the flavor they will love! This bread also caters to those who are gluten-free and dairy-free. If you aren’t gluten or dairy free, this would be a great bread to try – it tastes so good, your family won’t even notice a difference! The coconut oil makes the bread incredibly moist and imparts a subtle coconut flavor. This bread is good for breakfast, dessert, or anytime! You can make this recipe as either two traditional bread loaves or as muffins. Preheat oven to 350°F. Grease and flour two 9 x 5 loaf pans. If making muffins, line the muffin cups with paper liners. In a medium bowl, sift together the flour, baking powder, baking soda, cinnamon, and salt; set aside. In a large bowl, beat eggs until light yellow and frothy. Add the oil, brown sugar, vanilla, raw sugar and whisk until smooth and combined. Whisk in the zucchini and the mashed bananas. Mix the flour mixture into the wet mixture, making sure that all of the dry ingredients are well incorporated. Divide the batter evenly between the two loaf pans (if making muffins, fill the cups about two-thirds full). Bake until a toothpick inserted into the center comes out clean, 50 to 60 minutes. If making muffins, cook for about 20-25 minutes, or until a toothpick inserted into the center of a muffin comes out clean. Cool in the pan for 10 minutes, and then remove the bread to a wire rack before serving. Serve immediately; plain, with a delicious banana compound butter, or for dessert, serve alongside your favorite ice cream. Refrigerate any leftover bread or muffins. Gluten-Free Flour: You can make your own flour mix or use a pre-packaged flour. King Arthur© gluten-free flour mix was used in this recipe. Coconut Oil: Coconut oil is typically a solid below 75℉. If your oil is solid, be sure to heat it up until it liquefies. Zucchini is rich in B-complex vitamins – folate, B6, B1, B2, B3, and choline. Zucchini is packed with minerals like zinc and magnesium, which help to ensure healthy blood sugar regulation – making this vegetable especially advantageous for diabetics. It also contains other essential minerals such as iron, manganese, and phosphorus. Zucchini is a heart-friendly vegetable because of its high levels of potassium, which help moderate your blood pressure levels. It’s also rich in flavonoid antioxidants, which play a significant role in slowing down aging and preventing diseases.